Chatting and messaging apps allow people to share information (text, images, etc.) using a simple, well-understood interaction metaphor of a conversational time-line. These apps can help small task-oriented user groups, like caregivers of a family member, to coordinate with each other in group chats to get things done. However, whereas existing chat apps are well-suited for communicating and sharing content on-the-go, it is difficult to retrieve content generated and shared over time or related contents that showed up over time. Currently, it is also necessary to install multiple apps that may require separate user accounts for sharing for example task lists or calendars. 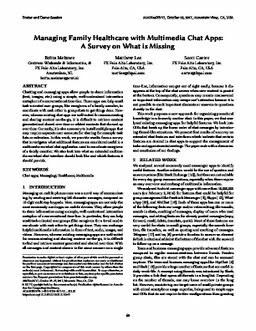 In this work, we provide results from a survey that investigates what additional features are considered useful in a multimedia enriched chat application used to coordinate caregivers of a family member. We also look into what an extended multimedia enriched chat interface should look like and which features it should provide. Stakeholder FX Palo Alto Laboratory, Inc.